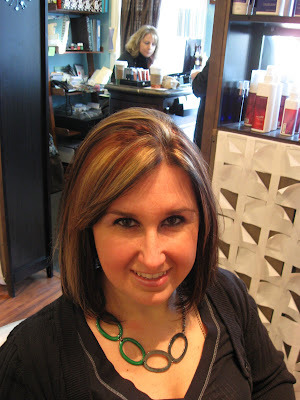 Bijou - A gem of a little salon in Skaneateles: Interesting Hair color by the Bijou girls! Interesting Hair color by the Bijou girls! Have you ever heard of convertible hair??? If I had to let you guess....what would you come up with?? 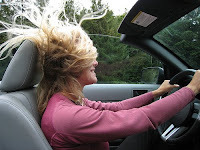 Something I bet like this...wild, windblown hair, flying in your face! Last year Kimberlee and I went to a hair show in New York City, the guy who did the runway show had a fabulous stage presence and talked about his $700 color. He had a really cool technique where the model he had, was a relatively normal color, then he whipped her around, flipped her part and suddenly she was a shocking platinum blond. So Kimberlee and I have talked about this color for a year now, but in small town Skaneateles, there weren't a lot of daring people to try it on! 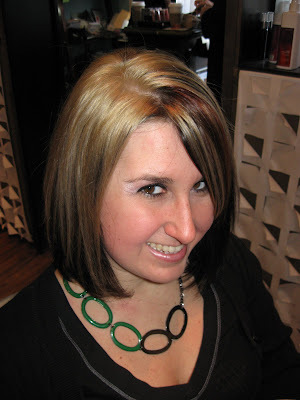 Me, I'm pretty basic, I like my highlighted blond hair, sometimes I like to mix a little copper or caramel low lights in there, but for all intensive purposes, I stay comfortably in my box. 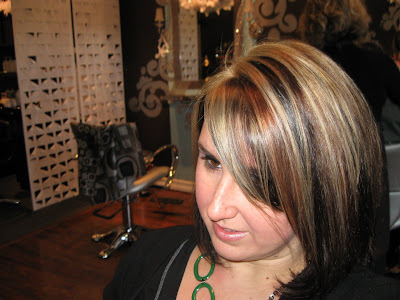 Lori, is the type that could go with some crazy colors, well some bold highlights or low lights, but right now, being a busy Mom of 3 and working part time, she keeps to her same color...when all the kids are in school, I see her getting more daring! 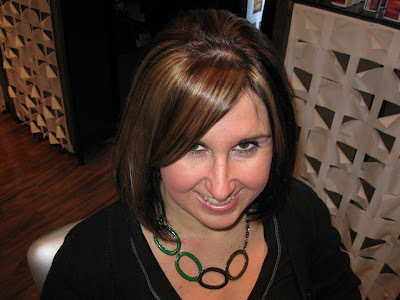 Michele, I think she goes through trendy colors, when she first started she was a dark chocolate brown with a BOLD streak of caramel on one side, she has pretty much morphed into a red head right now, each month a different shade. Kimberlee, changes all the time, most people look forward to her ever changing color, and sometimes I think we should post an update on the sidebar with what color she is, just to forewarn the ones that don't like change much:) She has been all platinum with black on the bottom peaking out, or allover a dark mocha with caramel ribboning, back to platinum and dark peaking through, she is a brave one, I thought she was the one who would try anything! And now for Courtney, I thought she was the basic brown in variations with some highlights or no highlights, but conservative....how wrong was I?? 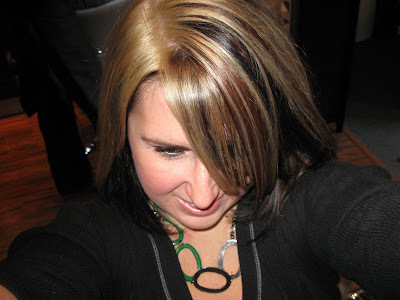 She jumped at the chance for trying our tales of "the convertible color"....and now on the odd days she can be platinum, and on the even days she can be a multitude of cherry red, caramel ribbons and black as black. Could it be that she is turning 30 next week and wants to take a walk on the wild side before she falls over the hill???! What can I say!! I love it ! I have to say I just love working with some awsome ladies. We all go to different classes and teach each other new trends!! If anyone wants to come see my hair just stop in!!! Thanks girls!! !